Whether you have a digital camera, MP3 player, or Gameboy, Varta delivers precisely the right energy. For almost every need. 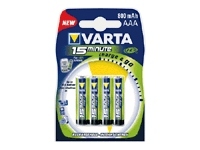 Varta offers the right energy solution for almost every device. With utmost performance, quality and innovation.